Motivating staff requires enthusiasm and effective leadership skills, which in turn can lift a company out of a rut and push them in the right direction. Before you can motivate your workforce you need to break down barriers, discriminations, divisions in the team and insecurities. Once these obstructions have been removed, you can move onto creating a productive, functional workforce. You want your staff to feel comfortable, confident and part of a united team, which will lift spirits and enhance the company’s performance. Many businesses, companies and organizations use simple but extremely effective ice breakers to break barriers and motivate their staff. A simple work ice breaker can be an effective tool in motivating staff. Instruct the group to break into pairs who match (roughly) height and weight. Each pair then put their backs together and link arms. Making sure arms are linked through the whole process, instruct the pairs to sit down, straighten their legs and then manoeuvre back to a standing position. To get the group working as team slowly build up the amount of people in a team. For instance, after you have had pairs carry out the game with groups of four then eight and eventually the whole group. This is a perfect game to encourage staff trust and motivate the company. This staff game requires a reasonable amount of space. Set up two writing boards (blackboards for example) beside each other. Ask the group to split into two teams. 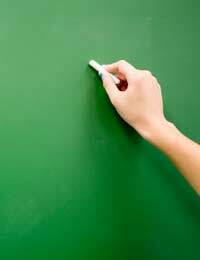 Then hand out a piece of chalk or marker to each team. Explain to the group that each team must compete against each other and see who can write a full (legible) sentence on the writing board using every member of the group. Each member must run to the board and write one word. Each team must be approximately 10 feet away from the board. One at a time each team member must sprint up to the board and write down the word. The first team to create a logical sentence wins. This is a fantastic motivational group game and spurs on a little competition to get staff interested. Divide the group into two teams. Hand each team a thick piece of rope (about 5 foot long). Each team elects two group members to hold up the rope. The rope should be held about 4 or 5 feet from the ground. Each team must then debate and decide on the easiest, quickest and most effective solution for the whole group to get over the rope. There’s an endless list of ice breakers that can be applied to team building exercises or company meetings that work wonders for motivating your staff. Whatever game you choose make sure participants have fun and interact.